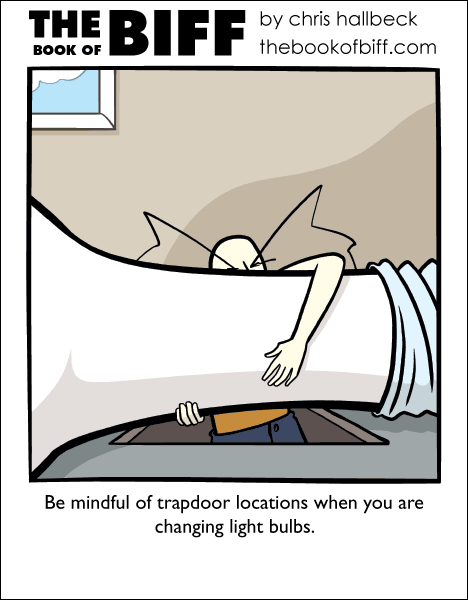 Trap doors can be a real problem in older homes. Many of the safety regulations in the trap industry that we take for granted are less than 30 years old. It’s frustrating that you have to leave your couch on the north edge of the living room and that you can never have a dance party in the dining room. Retrofitting newer units is always an option but to do it cleanly you really need to replace the entire floor and who wants to deal with picking out new carpeting after you just had the walls painted the perfect complementary shade of blue. The cloud in that picture/window (let’s, from now on, call them Picdows) is either really low down, or Biff’s rocket blasted off without him. In our old house, it was really easy to get onto the roof (just climb off the balcony and there you are – the right side, of course. Otherwise you end up on the ground). My stepdad used to do it, and I used to watch dutifully. Once, the roof gave way and he fell – actually FELL – through. I was watching at the time, and he seemed okay, but I took it upon myself to go and alert everyone by screaming. He climbed out through the trapdoor in the roof. Which is how this story links in at all with this. I don’t understand what this is about – is it an east coast thing? midwest thing? My only experience with trapdoors is on a stage. And you could tap dance on top of those if you wanted. Can someone explain trapdoors in a home and their purpose? No kidding. My house is from 1869. Landlord said he’d removed all trapdoors years and years ago. My problem is with the spring-loaded platforms below my 1970s-era trap doors. They keep launching rayon-clad disco singers up through the floor. Most annoying. Where would Biff have a light receptacle big enough for that lightbulb? Is he replacing the artificial sun on top of his roof or something? I’d like to know where he got the lightbulb…. does he run the worlds largest ligthbulb factory so that when the record holder breaks they just buy one and replace it? Gwid: Actually, that’s about right from a perspective kinda view. The focus is lower than normal height, since Biff is lower, so you can see up higher through the window.. now whether you could actually see clouds… meh. Gah, in my house, it’s not so much the trapdoors as the giant, shark-infested, underwater maze below them. Then again, the sharks all know me, and I can solve the puzzles on the hidden doors to get out. My theory is that Biff saves on lightbulbs by just using one very very large one to light his house. Brilliant! (pun intended). “I wanted a trap door, not a catapult!” – Chris, you just made me laugh more today. I just woke up, this is a great way to start it! the danger of applying SCIENCE to chores week? I also have no idea what trap doors this is a reference to. We used to have a trapdoor in my old house for getting in under the house itself. Once, on impulse, I opened it, only to find that the house’s previous owner had bolted it shut. At another house I once thought we had a cellar, but they’d just left the trapdoor there. The cellar had been filled in with concrete after one too many floodings. I’m not sure why the old owners didn’t just take the trapdoor away and put boards over the top or something. …although it WOULD be a good place to store my bodies, clones, and robots. and also a great place for a halloween party. probably.